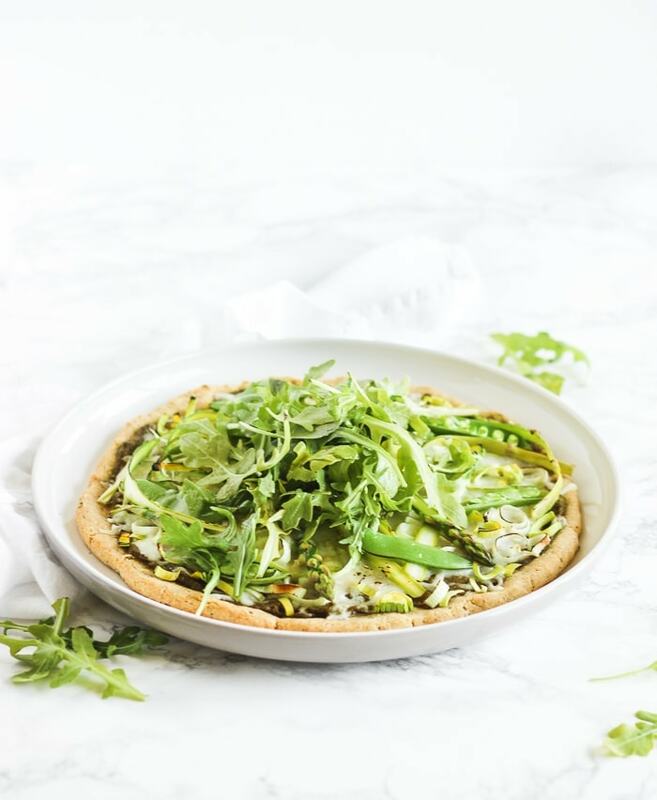 What do you get when you combine the most amazing spring produce, a crispy thin crust, and gooey cheese? 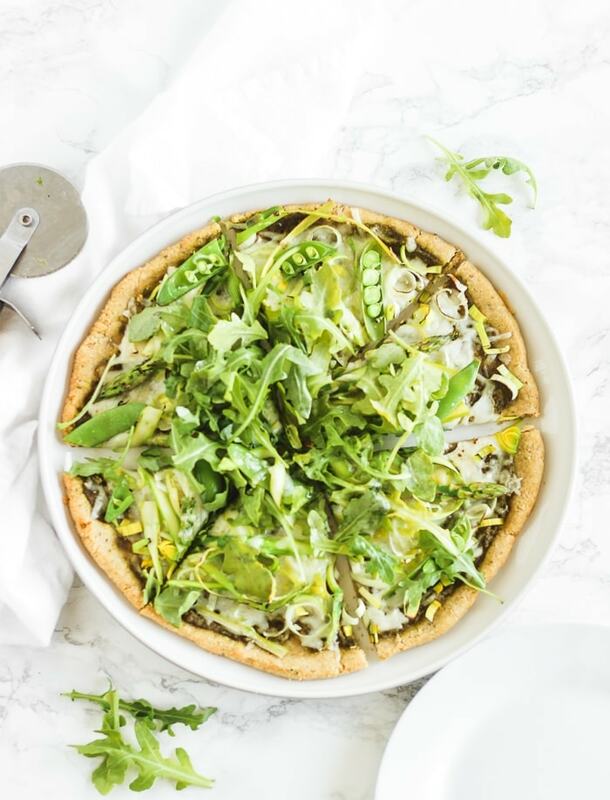 You get a delicious, healthy Spring Greens Pizza! We have an Italian deli down the street from our house that sells all sorts of Italian specialty meats and cheeses, wines and delicious sandwiches for lunch. They are always packed during the lunch hours, but I’ll still brave the traffic to get my favorite thing: the pizza crust! They sell handmade, super-thin pizza crusts in packs of 5 that we take home and store in the freezer for impromptu pizza nights. 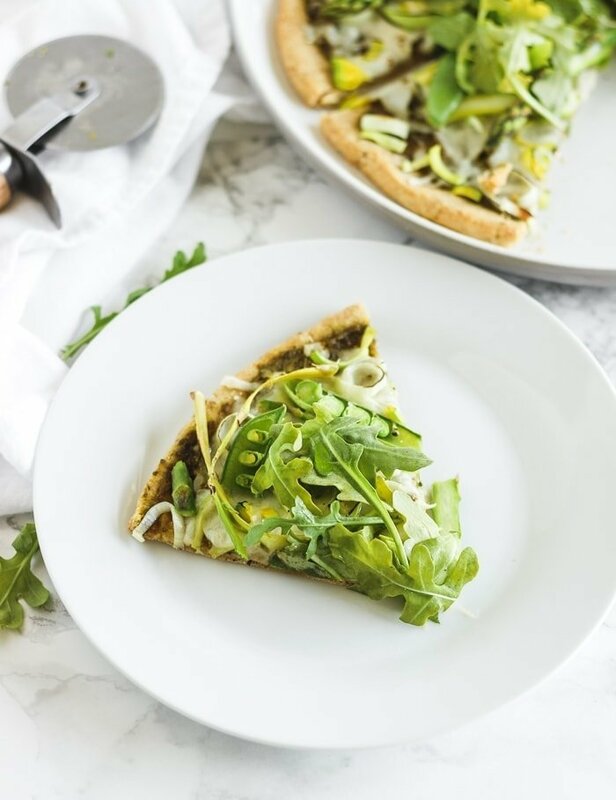 They are so convenient and even more delicious for yummy pizza creations like this spring greens pizza. 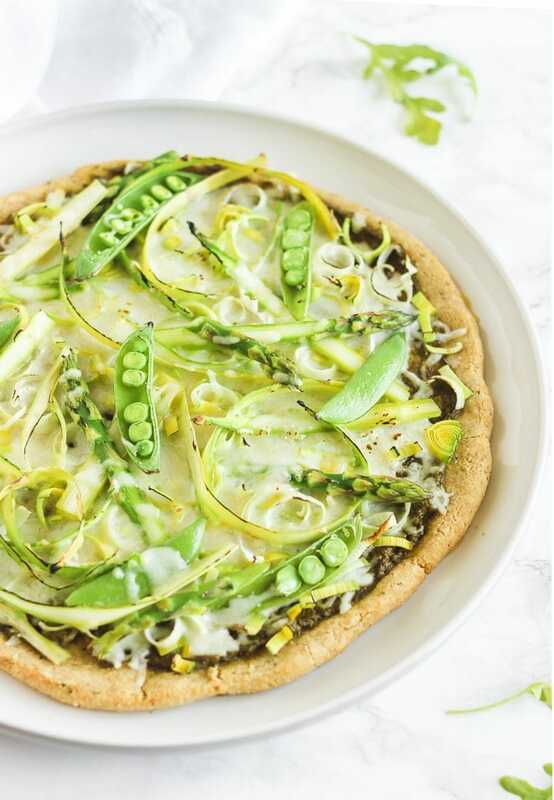 This yummy pizza combines all the best of spring veggies. Asparagus, leeks, peas and fresh lemony arugula pop against mozzarella and parmesan on a fresh pesto sauce. The crispy whole wheat crust makes it feel light. It’s just perfect on a warm spring evening with a green salad and a glass of white wine. It would be super tasty with grilled chicken for a more hearty pizza with extra protein. 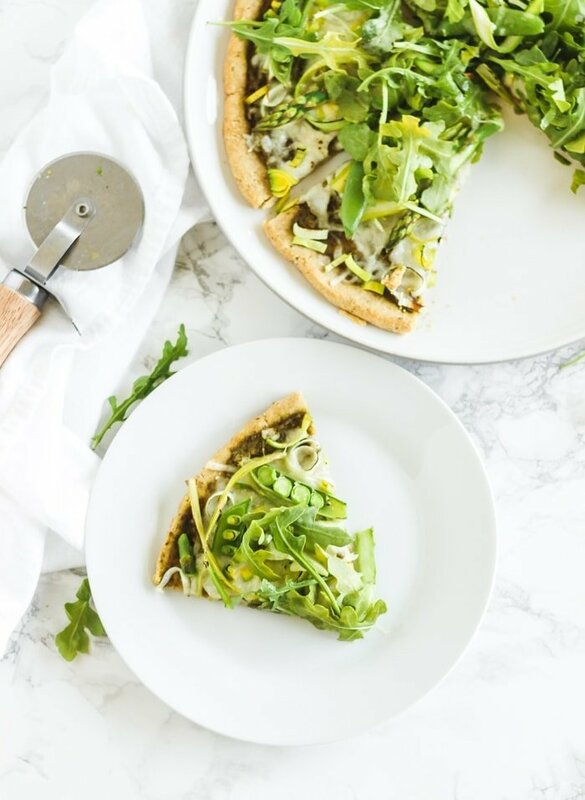 Try this delicious Spring Greens Pizza if you’re looking to switch up your pizza night routine. It’s healthy and bright, and way better than delivery! Place pizza stone in a cold oven and preheat oven to 400°F. On a thin whole wheat pizza crust, spread pesto evenly. Sprinkle half of the mozzarella and parmesan cheeses evenly over pesto. Add leeks, asparagus and snap peas. Sprinkle on remaining cheese. Carefully place pizza on heated pizza stone and bake for 25 to 30 minutes, or until cheese is melted and bubbly. While pizza is baking, toss arugula with lemon and oil in a large bowl. Season with salt and pepper to taste. 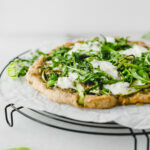 Remove pizza from oven and top with arugula. Cut pizza into 6-8 wedges and serve hot with a green salad.